What's a Prediabetic A1C? What's A1C Anyways? What is hemoglobin A1c, and what does it have to do with prediabetes and diabetes? Learn what your numbers mean and why your doctor focuses on it in this article. Plus, find out what you can do to manage your A1c with healthy lifestyle changes and help from Lark Diabetes Prevention Program. Your A1c is also known as your glycated hemoglobin, hemoglobin A1c, HbA1c, or glycohemoglobin. It is related to the amount of glucose (a type of sugar) that is in your blood over time. Hemoglobin is a protein in your red blood cells. As blood glucose circulates in your bloodstream, some of it attaches, or binds to, hemoglobin. Once your hemoglobin has glucose attached to it, it has been “glycated,” and is known as glycated hemoglobin or glycohemoglobin, or is abbreviated as HbA1c or A1c. Your A1c value is the percent of your hemoglobin that has glucose molecules attached to it. Prediabetes is a condition with above-normal blood sugar levels, and in diabetes, your blood sugar levels are higher than in prediabetes. In general, the higher your blood sugar levels, the higher your A1c. That is why healthcare professionals use A1c as a test for prediabetes and diabetes. Your A1c is considered a long-term indicator of your body’s blood sugar control. This is possible for a few reasons. · Your hemoglobin-containing red blood cells live for 120 days. · Glycosylation, or binding of glucose to hemoglobin, is permanent. · More sugar in your blood leads to more glycosylation. Healthcare professionals consider A1c to be a good overview of the past three months of blood sugar levels in your body. You have prediabetes if your blood sugar and A1c are above normal levels. The reason for an increase in blood sugar is because of insulin resistance, which develops over time. Once you have insulin resistance, your cells have more trouble taking up glucose to use for fuel or convert to and store as fat. This means that more of the glucose stays in your blood. Having prediabetes does not mean you need to sit and wait for type 2 diabetes to come, and it does not usually mean that you need to depend on medication to lower blood sugar. Instead, your lifestyle choices can greatly affect your blood sugar levels if you have prediabetes. Losing weight and eating right with a prediabetes diet, being physically active, and lowering stress can help lower A1c. On the other hand, these factors could raise blood sugar and A1c. · Maintaining a high weight or gaining unwanted weight. · Eating a high-glycemic diet with too many sugars or refined starches. · Not getting enough sleep, due to poor sleep hygiene or a sleep disorder. Your A1c is easy to measure. All you need is a simple blood test. The lab where you get your other blood tests, such as your routine cholesterol test, should offer the A1c test for prediabetes. Just ask your doctor for the lab order. · Your doctor recommends one. 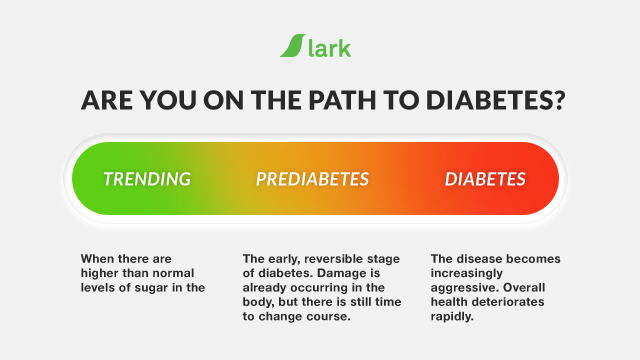 · You have risk factors for prediabetes or type 2 diabetes risk factors, such as being overweight or obese, having a family history of diabetes, or being over age 45. · You had a high value on a random or fasting plasma glucose test and your doctor wants to check your blood sugar in a different way. · Your cholesterol, triglycerides, or blood pressure are high. · Every three years if you do not have prediabetes. · Every year if you have prediabetes. · Every 6 months (twice a year) if you have diabetes and are meeting your treatment goals. · Quarterly (every 3 months) if you have diabetes and are not meeting your treatment goals. It is easy to get your A1c test done. After your doctor puts in the order or gives it to you, you can go to your regular lab for a blood draw. It can be at any time of the day, and it does not matter if you have eaten or not – it does not need to be a fasting blood test. · What the result means. Do you have prediabetes? · Whether you need any follow-up tests or appointments. · If you should you start a prediabetes diet, or make any changes to yours. · When you should get your next prediabetes A1c test. Your A1c results come back as a percent (%). These are the values that are used. · Prediabetes: 5.7 to 6.4%. The A1c test provides a long-term estimate of how well your blood sugar levels are controlled, but it is only one possible test for prediabetes. Do not be surprised if your healthcare provider orders one of the following tests instead of, or in addition to, your A1c test. · Fasting blood glucose. You fast overnight, or for at least 8 hours, and get your blood drawn. · Oral glucose tolerance test. This is a check of how well your body processed glucose after you consume it. With the test, you need to drink a solution containing 75 grams of glucose – the equivalent of the amount of sugar in 5 pop-tarts or 5 cups of Lucky Charms – and get your blood drawn 2 hours later. Your blood sugar levels spike after drinking that glucose load, but should fall significantly again within 2 hours. · Random blood glucose. This test cannot be used to diagnose prediabetes, but it can give a quick hint as to whether you may be having trouble controlling blood sugar. Your doctor might order it on the spur of the moment, since it is inexpensive and you can take it anytime and need not be fasting. There are many reasons to choose the prediabetes A1c test over fasting blood glucose or OGTT. It is easy. All you have to do is get your blood drawn once, at any time. In contrast, the fasting blood glucose test requires you to be…fasting. That may mean you need to take it in the morning, which could be inconvenient. If you are hooked on coffee, it can be a drag if your doctor tells you to skip the caffeine until after your test. The prediabetes A1c test is far more convenient than the OGTT because you need only get a single blood draw. With the OGTT, you need to drink the solution, hang around for 2 hours, and then get your blood drawn. It takes planning, not to mention that drinking that much glucose makes some people feel nauseous. Plus, the OGTT is more expensive than the A1c. While the OGTT and fasting blood glucose tests provide snapshots of how much sugar is in your blood right now, the A1c test shows how much sugar has been in your blood, on average, over the past three months. That can be helpful because a single high or low value from a blood glucose test may not tell the whole story about how high or low your blood sugar is the rest of the day. · Whether you have eaten recently. · Whether you have been smoking. · Whether you slept adequately last night. · If you are experiencing high amounts of stress. · What time of day it is. · If you exercised intensely within the past day. The benefit of A1c is that it does not respond to any of those factors in the short term. You can eat a big meal morning of your test, or go for a jog, and your A1c will not change. This means that your A1c may be more representative than a blood glucose test of your overall average. No single test is perfect, and that is true of the A1c test. It has a few drawbacks, which is why your doctor might recommend a fasting blood glucose test, too. · It is less sensitive, which means that it may not catch prediabetes as early. · Compared to OGTT, A1c is less specific to pancreatic beta cell health because it does not measure post-meal blood sugar, which is when beta cells release insulin. · A1c is affected not only by “glycation,” but also by “hemoglobin,” so conditions such as anemia (low hemoglobin) can affect your A1c result without being related to glucose. You can take charge if your A1c shows that you have prediabetes. Your diagnosis can be the cue to take steps to improve your health. A digital Diabetes Prevention Program (DPP) can offer you the tools you need to lower your risk for type 2 diabetes or delay its onset. It is designed to fit into your lifestyle and lead to long-term, sustainable changes – not be a fad diet that lasts only days or weeks. To further fit into your lifestyle, you can choose a digital DPP, such as Lark DPP. With Lark, all you need is your smartphone to connect anytime for support in making those healthy lifestyle changes. You can Sign up for Lark whenever you are ready.